How can I delete an Office 365 user? 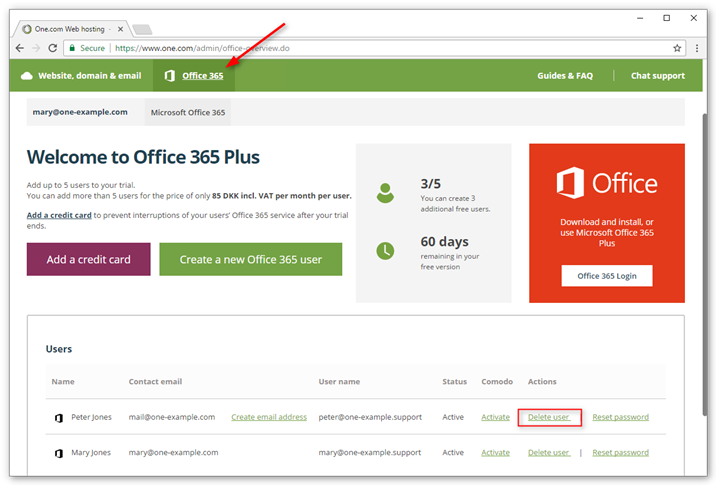 You can delete an Office 365 user from the One.com control panel. In the control panel click Office 365 at the top of the screen. Locate the user you want to delete and click Delete user. Click Delete user to confirm your action. Note: Office 365 is billed backwards. This means you will receive an invoice for the days the user was active during this billing month. You can restore a user within 30 days after you deleted it. After the 30 days, the user and all associated content will be erased permanently. How can I restore an Office 365 user?